So I made Almond Cupcakes last week. 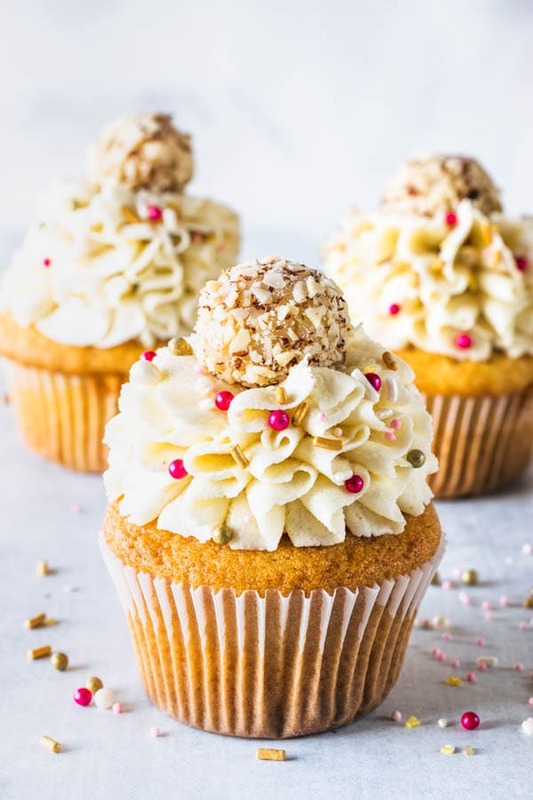 Almond Cupcakes, frosted with Almond Cream Cheese Frosting, topped with an Almond Fudge Ball (aka brigadeiro), and dressed up with sprinkles. It was my first time trying that ruffled effect with the frosting. I got the technique on this youtube video, at 1:36 mark. Though, she is using a Russian piping tip on the video, and I used a piping tip that is in this following kit. I actually used the one on the top left corner to frost my Almond Cupcakes. This tip doesn’t have a number information on it. It’s a huge tip, it is almost 2 inches tall, and the bottom opening is about 1.5 inches wide! Huge! 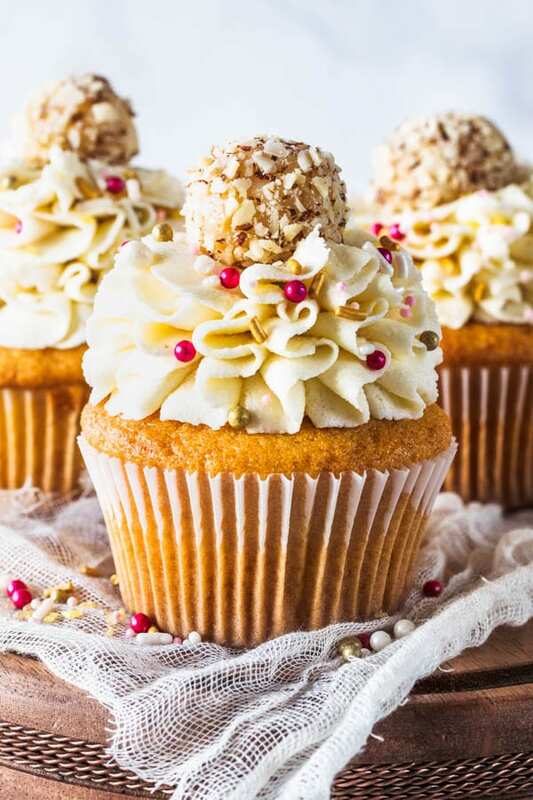 Anyway, I just figured I’d tell you how I piped this ruffled frosting on my almond cupcakes. I didn’t make pictures or videos of it, because it was my first time trying it so I wasn’t sure how it was going to work. After the 5th cupcake, I had it down lol. 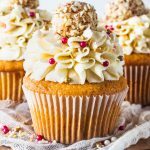 And I feel like the sprinkles and the almond fudge ball on top of the Almond Cupcakes really added to the delicate and sweet design. Speaking of the almond fudge ball on top. Let’s talk about it for a second. In Brazil, we call it a brigadeiro. It’s basically cooked condensed milk with butter and flavoring (chocolate, nuts, fruit, coconut etc). 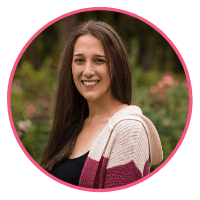 You cook it over the stove until you achieve a soft ball consistency, let it cool, roll it into balls and coat in something like sprinkles, crushed nuts, shredded coconut, or sugar, to help the balls keep from sticking. This treat is widely popular in Brazil, to the point that if you throw a birthday party and don’t serve these, you’ll probably get kicked out of the country immediately, and your family won’t speak to you anymore, in shame. Brigadeiro is incredibly easy to make and I have never met anyone who hasn’t LOVED them! 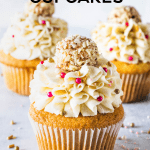 Besides these Almond Cupcakes, I’ve actually topped a few of my other cupcakes with these types of treats. 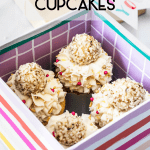 Like my Macadamia Coconut Cupcakes, and my Death by Brigadeiro Cupcakes. I felt like these cupcakes were so festive, they were fitting for a birthday present, what do you think? What if we put them inside of a cute box like this one? I found it at TJ Maxx!! And the sprinkles were also purchased at Tj Maxx, but I don’t remember what brand they were. I really didn’t notice. Just thought they were cute. 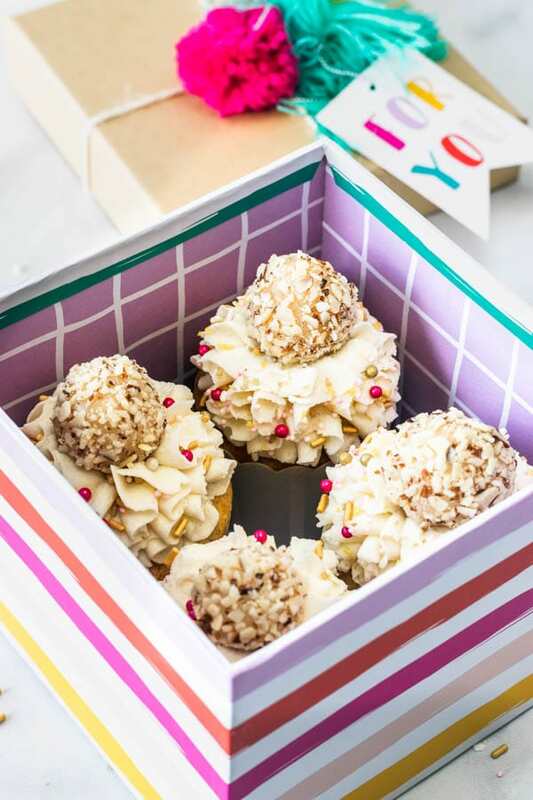 What could be a better birthday gift than cupcakes with sprinkles, a treat on top, inside of a pretty box? 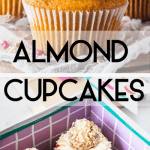 Anyway, I really hope you liked today’s recipe, as these Almond Cupcakes were some of my favorites because I love almonds so much! 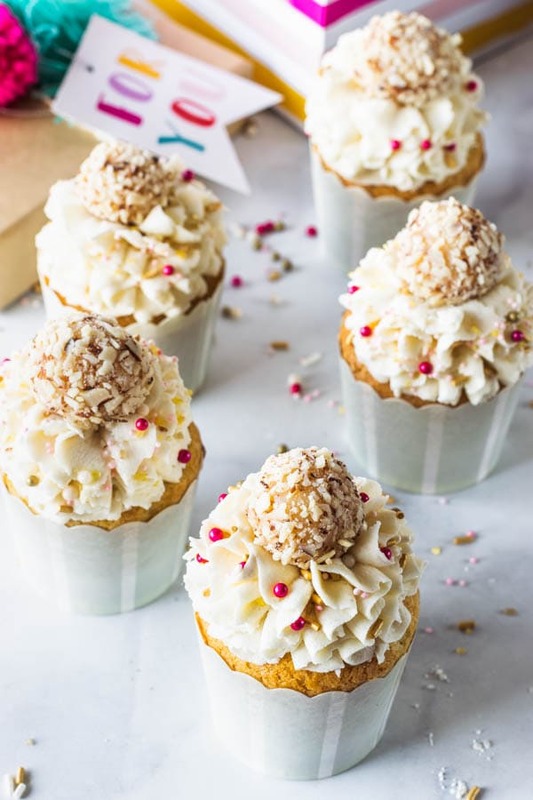 If you love almonds, these Almond Cupcakes are the treat for you. And trust me on the fudge ball. You will be delighted! 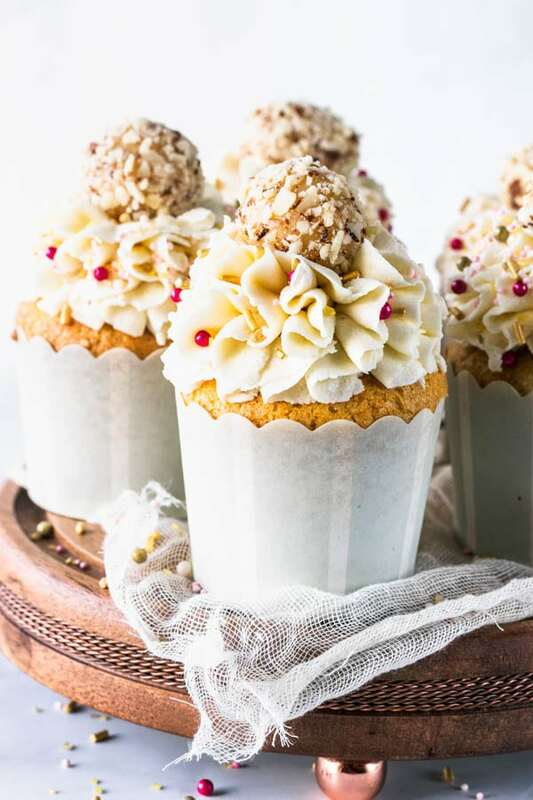 These Almond Cupcakes come with a surprise on top: an almond fudge ball (almond brigadeiro). 3/4 cups granulated sugar 150 grams, 5.3 oz. Sift all-purpose flour, almond flour, baking powder, baking soda and salt together. Set aside. Add half of the flour, whisk briefly until just combined. Now, add half of the buttermilk, and whisk until incorporated. Add the other half of the dry ingredients and whisk gently. Finally, add rest of the buttermilk. Make sure to just whisk the mixture until combined. Start by creaming the butter and cream cheese in the bowl of an electric mixer for about 2 minutes. With the mixer off, add sifted powdered sugar and almond flour to the cream cheese and butter mixture. Stir on low until sugar has been incorporated. Raise speed to medium-high and cream for a couple of minutes, until fluffy. Add extracts and mix to combine. In a small saucepan combine condensed milk, almond flour, butter, and almond extract. Bring mixture to a boil over medium high heat. Once it gets to a boil, reduce heat to medium low. Keep stirring and cooking until mixture is very thick. It will take about 10 minutes, sometimes more depending on how low you have the heat on. Basically, you want to be able to flip the pan on the side, and the whole fudge should slide to the bottom. Brazilians usually describe this as looking like a wave at the beach, because the top part of the fudge mixture is supposed to curl up slightly resembling a wave. Trust me, you will be able to identify this step once you get there. When that happens, turn the heat off and transfer fudge to a heat-proof bowl. Let it cool down completely and chill it in the fridge for a few hours before rolling it up. Lightly grease your hands with butter, pick up small amounts of fudge with a spoon and roll it between your greased hands into a smooth ball. You can place them in small paper liners they sell at most stores that carry cake decorating supplies. Store these in the fridge for up to 4 days, and in the freezer for up to a couple of months. Pipe buttercream on top of cupcakes. Tenho vontade de fazer todas receitas, deliciosas!!!! !